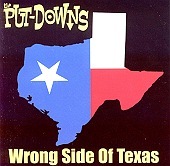 Fast punk with an undeniable country influence (absorbed from their Texas upbringing), the aptly titled Wrong Side of Texas portrays The Put-Downs as the country band gone astray, preferring the uncontrollable, chaotic punk style to the crying-in-your-beer of country. Though, no matter how much they run, they can't hide, because it's in the air they breath and the water they drink. But, this is not alt-country, this is full-throttle punk rock. It just knows its roots. I'll give it a B.